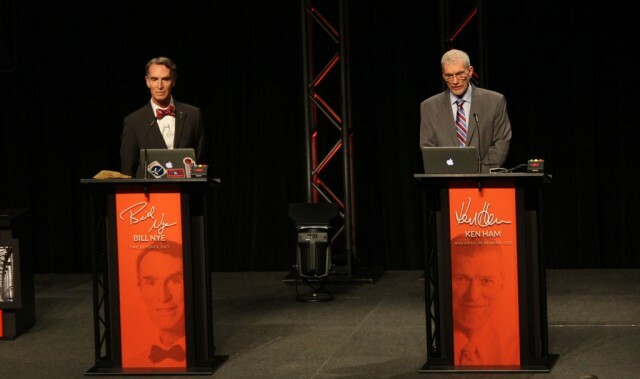 By now, I’m sure, many people know about the debate between Bill Nye and Ken Ham.? Bill Nye, he of the bow tie, the science guy, stepped up to the podium to have it out, toe-to-toe, with Ken Ham, erstwhile champion of creationism, founder of the Creation Museum in Kentucky which has been the subject of continual mirthful derision by anyone with even a scintilla of understanding about science.? They were to debate evolution versus creationism, which in my mind is like debating the similarities between Einstein and Sasquatch.? Other than the assertion by certain folks that they are somehow (a) equivalent and (b)…well, really, there is no “b” in this formulation. Was that unkind?? Sorry.? (Not really.)?? But while any single one of these can be dismissed as, oh, lack of attention, missed something in biology class (or astronomy), didn’t see that special on NOVA, collectively this amounts to willful ignorance at best. “If humans came from monkeys, why are there still monkeys?”? Seriously?? Do you really not know how dumb that is?? You came from your parents—we all did—so why are there still parents?? Sorry, that was flip, but it does, actually, point up the problem, albeit in a rather crude and simplistic way. And noetics?? That isn’t part of any segment of this debate, so…? There was a time I would get mightily energized by this kind of thing.? I admit I had a deep-seated interest in being on the “right” side of this debate.? I still do, but it hardly gets me out the door anymore because I realized somewhere along the way that what we’ve been witnessing in the efforts of people like Ken Ham, as strenuous and perhaps sincere as they are, is the death spasm of a world view that doesn’t work.? It never did, but there was a time that understanding that didn’t make much difference, except to a few intellectual outliers here and there.? The fever pitch of condemnation coming from them is the sound of panic as the world prepares to leave them behind. No, I’m not talking about the death of religion.? I do not believe that is possible.? I’m only talking about a very public formulation of a view of religion that has as its primary purpose nothing more than the regimentation of the faithful and the casting out of the new.? I’m talking about a narrative that seeks to impose and deny.? Impose its substance and form and deny any countervailing view.? I’m talking, really, about style. Style is about identity.? When we talk about it that way, as style, it seems insignificant in the larger scheme of things.? Fashion.? And much of it is ephemeral.? But shift it to something else, as in artistic expression, and it takes on a bit more meaning.? The style of a writer is that writer’s voice, personality—identity.? There is something so deeply personal about style in this sense and we all recognize it.? We instantly recognize a musician with whom we are familiar by the style of playing.? Unknown canvases by painters declare identity in the many brushstroke or photographs betray their creators by the particular angle, frame, contrast.? Style at this level is inextricably linked to identity and when that style is declared no longer valid, a kind of death attends. Because this is ?sthetics, something utterly vital and intrinsic to our sense of self, yet so rarely discussed when any list of what makes us human gets trotted out for debate.? How we see the world and how we react to what we see, this is ?sthetics in action and it defines us.? It defines us culturally, historically, and individually.? You can see it in that list of questions, in many ways so pathetic, when the question is framed in terms of awe and wonder.? A sunset, the amazingness of the world—even that fey reference to noetics—these are questions of reaction and interpretation to sensory experience, filtered through a value system that provides us with a quality of self grounded in our relation to the matrix of reality through which we move: ??sthetics. Ken Ham’s museum displays exhibits showing humans coexisting with dinosaurs.? At some level, this is a world he wishes to have as real.? What kid doesn’t love dinosaurs at some point?? It’s inexplicable.? I’m continually amazed at what seems to be a persistent fascination across generations.? Part of us really wants there to be dinosaurs.? Not only that, but dinosaurs in our midst, at least at some point. Dinosaurs aren’t in the Bible.? In fact, I know of no holy book in any culture that mentions them unless you want to see dragons as some neolithic abstraction of dinosaurs.?? (They’re not, they emerge out of very different pools of myth, namely serpents, the Worm, but after the discovery and ultimate understanding of fossil dinosaurs dragons became more and more visually conforming to them.)? Yet even the most ardent of creationists are fascinated.? There is no mention of them in Genesis, they would never have fit on the ark, and there’s no mention in that story of any animals left behind (the song about the unicorn notwithstanding).? Had they been, we would have found much, much fresher bones, not buried nearly so deep. At some point people like Ken Ham came to accept the reality of dinosaurs, not as deceptive deposits from Satan to worry our overly-curious intellects, but as species in their own right.? Intentionally or not, they had to accept science in order to make the effort to write them into their stunted history of the universe, which has opened them to eventual extinction as examples of mainstream thought, much less champions of any kind of reality. In a way, the debate just passed was totally unfair.? Ken Ham kept pointing to his narrative as its own evidence, offering nothing beyond it to answer the evidence-laden arguments of his opponent.? He wasn’t even in the same debate, really.? He was there to insist that all these things Bill Nye represents should be ignored in favor of a story.? He insists that the story is sufficient and this other thing, this science thing, is nothing but an evil distraction from what he thinks is important.? The sad part is he probably doesn’t even know why that story is important. It’s important because all wonder-based growth begins as a story.? We’re fascinated, entranced, and there’s magic in the narrative.? So much magic that we want to know more.? And so we go looking and if we look honestly we find so much else that transcends the modest confines of that first story.? We find universes of wonder, which we might never have looked for without first having been delighted by a story.? Ken Ham found a story that amazed him. But then he stopped.? He stopped looking, because, it seems, he never wanted to leave that first moment of childlike wonder, wanting it to be everything.? It’s sad because while we can revisit it and we can experience the same sensation again and again and again, with new discoveries, if we try to freeze that moment and keep it, unchanging, it either fades…or rots…all on its own.? What some folks do then is build a museum in their hearts to preserve a memory that is no longer there, leaving us with the surrounding edifice and an echo.? Without new sounds, new sights, new growth, the museum calcifies and eventually becomes a fossil, never buried, bleached and empty. At some point, Ken Ham built that museum out in the open for everyone to visit. Apparently, fewer and fewer go.? It possesses novelty, but no genuine wonder.? And without wonder, what is there? “Synchronized Presidental Debating” highlights the lack of meaningful dialogue. Beautiful. Thank you for these observations. Spot on. I hadn’t thought of Ham’s inner struggle as a matter of aethestics, but that analysis works well. I also see this as an example of cognitive dissonance. Ham is entranced by science, then follows it a little too far for his own comfort level. What results is a cognitive vomiting, a refusal to consider the parts that conflict with his delight in charging a long line of chumps real money to see his faux museum.